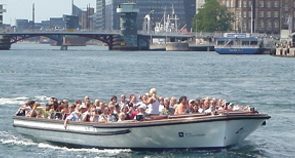 A canal tour of Copenhagen with sandwich and beverages at the fortress ‘Trekroner‘ at the entrance of the harbour of Copenhagen will take place Monday August 13, 2018, after the sessions. A classical event when visiting Copenhagen is to see the city and the habour from the water side. This trip will be combined with a dinner at the island of Trekroner at the entrance of the harbour of Copenhagen. The island used to be a part of the fortresses of Copenhagen, but is now been used to show Copenhagen from its best side. Entrance fee for participants and accompanying persons is 50 Euros. Space is limited, so please reserve early.